LANSING, Mich. (AP) — Republicans who control Michigan’s Legislature voted Wednesday to advance a measure that strips campaign-finance oversight power from the Democratic secretary of state-elect, and they moved to give lawmakers authority to stand up for GOP-backed laws if they think the incoming Democratic governor and attorney general are not adequately defending the state’s interests. 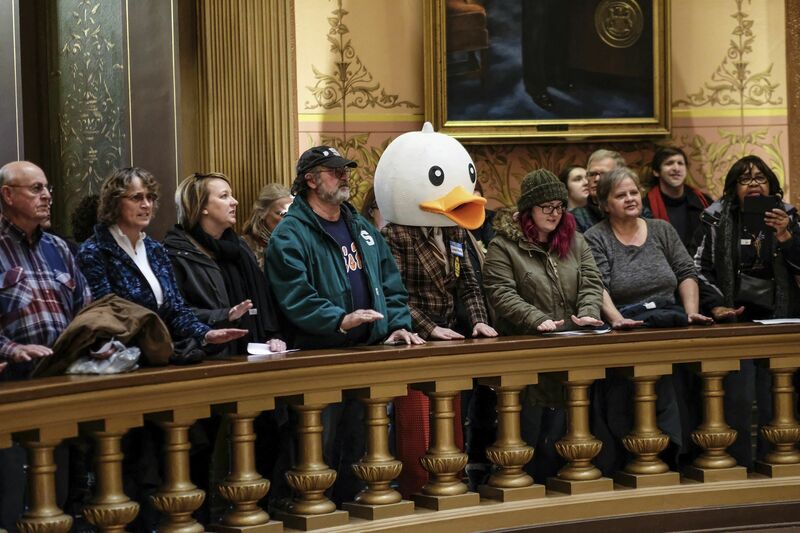 The lame-duck moves followed within hours of similar efforts in Wisconsin , where lawmakers voted earlier Wednesday to shift clout to the Republican-controlled Legislature and weaken the Democrat replacing the GOP governor. Michigan Democrats in January will jointly hold the governor, attorney general and secretary offices for the first time in 28 years, but the Legislature will continue to be controlled by Republicans. A day after GOP lawmakers finalized an unprecedented maneuver to gut minimum wage and paid sick leave laws , a Senate panel passed legislation that would create the Fair Political Practices Commission to enforce the campaign-finance law rather than Secretary of State-elect Jocelyn Benson, who ran in part on a pledge to advocate for election transparency. Democrats called the bill, which is expected to clear the full Senate today, a blatant power grab that would fly in the face of voters. Republican Gov. Rick Snyder has not taken a position on the measure or others that could win final legislative approval as soon as next week. “At no point did voters say they wanted the rules manipulated. At no point did they say they wanted bills rushed through a hasty lame-duck session,” said Patrick Schuh, state director for the liberal group America Votes. He questioned the timing, saying such a commission was not proposed until a Democrat is on the verge of leading the secretary of state office for the first time in two-dozen years. Other critics of the bill, however, contended that the commission would be ineffectual, saying its members would deadlock and be accountable to political parties that would submit a list of possible appointees to the governor. Also Wednesday, the House voted 58-50 for legislation that would empower the Legislature, House or Senate to intervene in any suit at any stage, a right already granted to the attorney general. A bill that won Senate approval on a 25-12 vote over Democrats’ objections would influence how Benson implements a new voter-approved constitutional amendment that establishes an independent redistricting commission to draw congressional and legislative maps instead of the partisan Legislature. The former measure is seen as a maneuver to ensure that Republicans could support laws if Democratic Gov.-elect Gretchen Whitmer and Democratic Attorney General-elect Nessel are lukewarm about GOP-passed measures.